1) D. Mannings, Sir Joshua Reynolds, I, 2000, no.973 [Second special exhibition of National Portraits (William and Mary to MDCCC), South Kensington, 1867 (832)]. 2) Also engraved as a half length by W. Sharp 1788; later prints include those by R. Cooper 1814, J. Kennerly 1823, S. W. Reynolds 1833 and W. O. Geller 1836. 3) C. R. Leslie & T. Taylor, Life and Times of Sir Joshua Reynolds, 1865, II, p 475. In 1809 Farington had described the original as ‘utterly gone by cracking &c’ (Joseph Farington, Diary, 10 June). 4) Sir Everard Home (1756-1832), Hunter’s brother-in-law and executor. 5) J. Hunter, A Treatise on the Blood ...,1794, pp XXXIV-XXXV. In 1785 Hunter had moved to Leicester Square becoming a near-neighbour of Reynolds. 6) C. R. Leslie & T. Taylor, Life and Times of Sir Joshua Reynolds, 1865, II, p 475. 7) X-radiographs taken by the NPG in 1959. 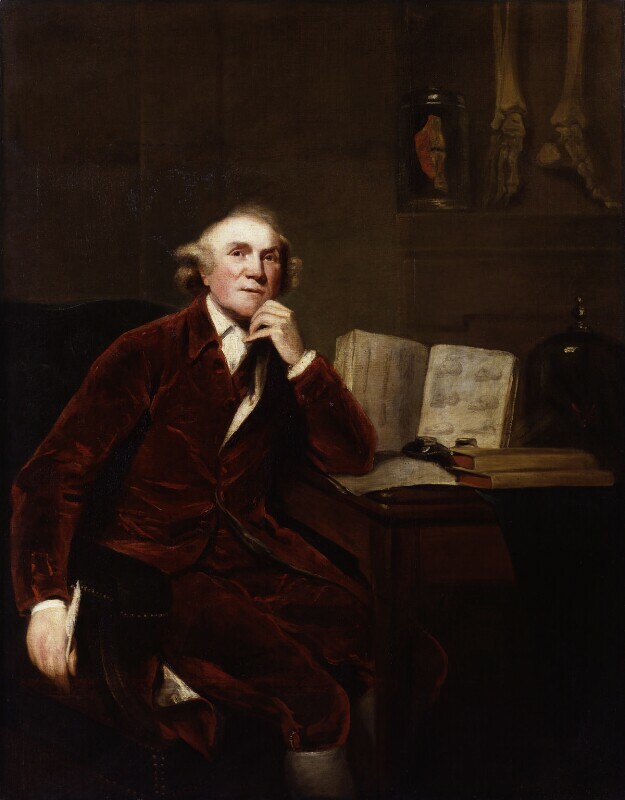 8) Hunter’s health had not been good; he suffered increasingly from angina and gout; in May 1788 he had had ‘a very severe indisposition for three weeks’ (S. Paget, John Hunter, 1897, pp 168, 181). 9) Ibid., p 180 (where Hunter is also described as ‘a great admirer’ of Sharp’s work; J. T. Smith, Nollekens and his Times, ed. W. Whitten, 1920, I, p 267. Sharp’s print was also, apparently, admired by Gainsborough, see Gainsborough NPG 1107. 10) Sir Charles Bell’s Letters, 1870, p 208. On 12 August he had singled out the Hunter portrait within the Reynolds exhibition at the British Institution as being ‘admirable’ (ibid., p 207). 11) C. R. Leslie, Autobiographical Recollections, 1860, I, pp 77-78. 12) British Gallery of Contemporary Portraits, 1822, I, p 70. 13) Mrs R. L. Poole, Catalogue of Portraits in the possession of the University, Colleges and City and County of Oxford, II, pp 89-90. 14) Exhibited RA 1798 (797); his preparatory drawing in the NPG Bone albums (R. Walker, 'Henry Bone's Pencil Drawings in the National Portrait Gallery', Wal. Soc., LXI, 1999, no.294). 15) Illus. S. Taylor, John Hunter and his Painters, Royal College of Surgeons of England, 1993, fig.2; the beard grown during an outbreak of a rash (J. Kobler, The Reluctant Surgeon, 1960, p 265). The portrait has been whimsically described as the first by Reynolds, who then devised the idea of taking a face mask so that Hunter would have to shave (see NPG 4288n3); it passed from Hunter’s widow to James Weatherall; thence to his nephew Thomas Knight, by whom presented to the Apothecaries, 1857 (see S. Taylor, John Hunter and his Painters, Royal College of Surgeons of England, 1993, p 1). 16) Reduced copies include one with Spink in 1976, and those sold Christie’s, 12 April 1995, lot 485, and another 11 March 1999, lot 33. A. Graves & W. V. Cronin, A History of the Works of Sir Joshua Reynolds, 4 vols., 1899-1901, II, pp 495-96. D. Mannings, Sir Joshua Reynolds, 2 vols., 2000, no.973c. 1 These appear indicative rather than specific titles. 2 He was drawn by Thomas Rowlandson (Royal Society of Surgeons, London; illus. W. LeFanu, A Catalogue of the Portraits and other paintings drawings and sculpture in the Royal College of Surgeons of England, 1960, pl.52), the drawing engraved (M. D. George, British Museum, Catalogue of Political and Personal Satires, VI, 6856). Sir Charles Bell, professor of surgery at the University of Edinburgh;1 his widow, Marian, Lady Bell, from whom purchased 1859. 1 A label formerly verso reads: This Portrait of John Hunter was copied by John Jackson R.A. from the original by Sir Joshua Reynolds in the possession of the Royal College of Surgeons, London, in the year 1816, for Sir Charles Bell: and it was in his possession till his death April 29th 1842. Apples to Atoms, Portraits of Scientists from Newton to Rutherford, NPG travelling exhibition, Science Museum, Norwich, Grasmere, Coalbrookdale, 1986-87; The Room in View, NPG, 1996-98.